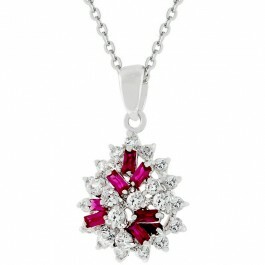 The Cluster of Ruby CZ pendant is beautifully designed with ruby red CZ and round clear CZ all clustered together for that indulged look. It draws attention and adds style with elegance to your favorite top or dress. White Gold Rhodium Bond is achieved using an electroplating process that coats the item with heavy layers of rhodium, a close cousin of platinum that costs three times as much, which gives our jewelry a platinum luster.